The instrumentation requirements alone make radio astronomy seem a poor choice for a hobby: Parabolic dishes dozens of meters in diameter, precise tracking systems for moving dozens of tons of mass, cooled ultra-low-noise receiver frontends and FPGA spectrometers put the discipline beyond the reach of most enthusiasts. Some groups, however, got the opportunity of working on former professional telescopes. The team of Astropeiler Stockert e.V. is one of the more active groups in Europe. It runs the Stockert radio observatory near Bad Münstereifel. 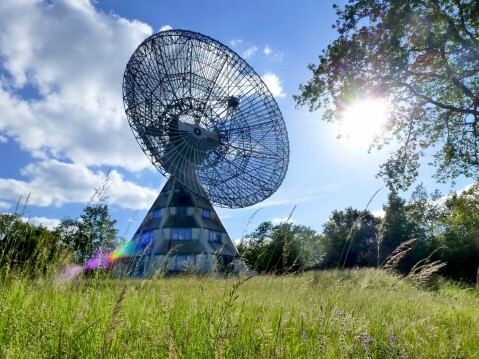 One 25 meter and one 10 meter radio telescope have been restored back to working order. This talk presents the project’s development from the first site cleanup in 2006 to the latest pulsar measurements only seven years later. Apart from the development of the tracking and control system, we will discuss the instrumentation and algorithms used at the telescopes. Afterwards, we will take a look at what our ham radio, optical astronomy and Jugend Forscht-groups are doing. The talk closes with ideas for planned projects and some thoughts about the borders of doing-it-yourself.